Welcome to Casa Rio Mar Grande oceanfront private vacation home located on the majestic South End of Jaco Beach, Costa Rica -- where the rainforest greets the sea. This direct beachfront home – built in 1990 – has undergone a total makeover into a first-class masterpiece of beachfront beauty offering not only privacy and seclusion for up to 30 guests with children. Casa Rio Mar Grande has an enormous 2nd-floor panoramic veranda looking out over the Pacific Ocean with 7-bedrooms, 7-bathrooms, 2-kitchens, 8-flat screen TVs, 4-sofa sleepers, air-conditioning throughout, sound system, internet, expansive outdoor decks plus a large-angular, duel-level swimming pool with adjacent elevated sun deck overlooking the ocean. It is outfitted with only the finest locally produced furnishings, granite kitchen-counter tops, stainless steel appliances and Costa Rican art work. This vacation rental home defines the “WOW” factor complete with a front row seat on the ocean. 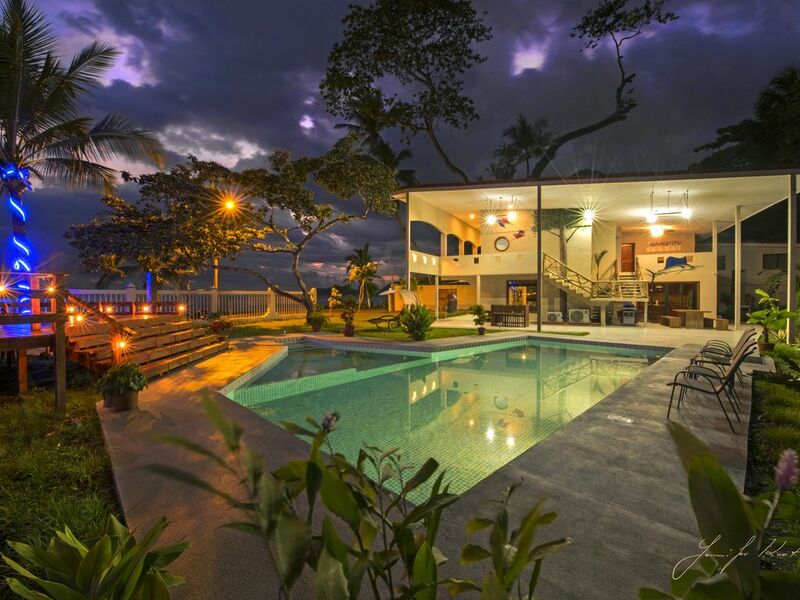 Situated only 1-mile from downtown Jaco Beach this vacation rental is perfect for family or high school reunions, bachelor parties, weddings with receptions, church groups/retreats, corporate functions/seminars or any special event. Need a salsa or reggae band by the pool? No problem. All life styles are welcome at Casa Rio Mar Grande. Located only 62-miles from the San Jose airport, the privacy this home offers is unequalled on Jaco Beach because it’s at the end of a dead-end beachfront paved road. This luxurious spectacular residence also offers 24/7 security, off-street-gated parking with expert staff and gourmet chef services available for our guests. Golf cart rentals are also offered. World famous Jaco Beach – a mecca for surfers since the 1960s – offers a vibrant night life, superb restaurants for any appetite, casinos and sports bars – it’s all only a short walk up the beach or a quick cab ride. Close by are also grocery stores, bakeries, banks, pharmacies, dentists, doctors, surf shops, boutiques and souvenir shops. Our concierge will hook you up with any tour now operating on or near Jaco – sunset horseback rides on the beach, ziplining & mountain tramway, ATV mountain rides, parasailing, white-water rafting, waterfalls, off-shore deep-sea fishing, yoga classes, surfing & standup paddle board lessons, clear water SCUBA diving & snorkeling, mountain hiking & repelling, day trips to Manuel Antonio National Park, Tortuga Island and other locations. One thing we guarantee, your stay at Casa Rio Mar Grande will be an unforgettable, memory-making beachfront experience beyond compare – so much so you won’t want to go home. Does your group need more bedrooms, beds and additional space. Add the house next door for your group. Casa Rio Mar beach house has 5-bedrooms, 5-bathrooms. It's a beachfront beauty with an oceanfront swimming pool, balcony – everything you would expect. VRBO listing number 263170. Both beach houses accommodate up to 40-people and are owned by the same owner. Both houses together, VRBO listing number 1368132. Additional seating outside under a covered patio with 2 additional tables that can seat up to 16 people. Our group of 13 had an amazing time, thanks to an awesome property and great location, and to the service from Matt, the owner (Jim) and the entire staff at the house. We highly recommend a surf lesson at the surf school 2 properties down the beach, and afternoon fish tacos and drinks at the restaurant just up the beach before the road turns (can’t recall the name of it). We also enjoyed a quick 5-10 min cab ride to Playa Hermosa a couple afternoons to watch the big waves and take a walk on the beautiful, almost empty Hermosa beach. The home itself is well equipped and comfortable. We liked cooling off in the pool and spending mornings and evenings on the deck that looks out directly to the beach. Pura Vida! The only way to know is to go! The place is perfectly placed on Jaco Beach. Matt and his guys are the best. Anything we wanted, we got. No questions asked. The place is perfect for large groups are a group of 6 like us. Make sure to get the chef service and the massages on the back deck were phenomenal, best ever! Oh yeah, we had a band! If you do Costa Rica, Pura Vida is at Casa Rio Mar Grande!!!!!!! Remarkable location, home, and team!!! I can't say enough about this home and staff. Although the home is spectacular in every way, very inviting, and spacious; the beach front yard and pool with its constant breeze is paradise! Apart from the home, the people providing the concierge service that comes free with the rental is second to none. Our contact for the home - Matt - provides customer service on a whole new level. He was very responsive to my late night and early morning spur of the moment questions. He ensured all of our questions and concerns were answered months before and during our trip. He helped plan an awesome excursion with an ATV ride through the mountains and a 7 zip-line rainforest adventure. He also pointed us to some really fun places and things to check out tailored to us. He also connected us with an amazing chef who does everything from shopping, cooking a 5-star meal, table setup, and clean up all in the comfort of being home. What started out as only breakfast quickly turned into "please cook every meal for us" because it was so delicious, so well executed, and allowed us to enjoy Costa Rica instead of all of the time involved with going out. From all 14 of the guys, a huge thanks to Matt for pulling together all the logistics and all that you did to make this trip truly unforgettable! We can't wait to come back and do it again. I appreciate all the kind words you have to say about your stay with us at Casa Rio Mar Grande, I told you the chefs do an absolutely amazing job. I had a blast helping you guys plan an awesome trip here in Paradise and I look forward to you guys coming back again in the future. Thanks for coming and visiting us in Costa Rica. Pura Vida!!! Our group had a great time staying at Casa Rio Mar 2. The beachfront location is ideal at the South end of Jaco beach and even had a couple small restaurants on the same street. The house was in excellent condition, with all bedrooms having AC and private bathrooms.. The outdoor space is awesome with covered porch/balconies, pool, and large deck. Highly recommend and will definitely be back. Unique in that you can have multiple people stay, but all bedrooms are private and have unique access points. Amazing outdoor gathering area with a pool, deck, and cover incase it rains. Very clean, very safe, and very close to the action of Jaco and all there is to do. Additionally, they were very responsive to our needs, and gave us all the tips to the city we asked for. Man you talk about the ultimate house to host a Bachelor Party and Fantasy Football draft---this is it. We had 11 guys and some shared rooms and some had their own---but every bedroom has its own bathroom and shower---perfect for a bunch of guys partying. Stephen it was great to meet you guys!! It makes me happy to hear that you guys had a blast. THANK YOU for staying with us and I look forward to having you guys back in the near future.